This is the incredible rise and unbelievable fall of a woman whose energy and ambition is often overshadowed by Napoleon’s military might. 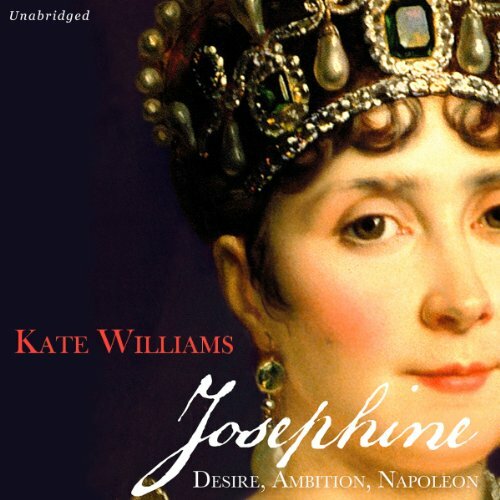 In this triumphant biography, Kate Williams tells Josephine’s searing story, of sexual obsession, politics and surviving as a woman in a man’s world. Josephine, the fabulous hostess and skilled diplomat, was the perfect consort to the ambitious but obnoxious Napoleon. With her by his side, he became the greatest man in Europe, the Supreme Emperor; and she amassed a jewellery box with more diamonds than Marie Antoinette’s. But as his fame grew, Napoleon became increasingly obsessed with his need for an heir and irritated with Josephine’s extravagant spending. The woman who had enchanted France became desperate and jealous. Until, a divorcee aged forty-seven, she was forced to watch from the sidelines as Napoleon and his young bride produced a child. Very enjoyable. Loved listening. Brilliant. I enjoyed the reader and her French pronunciation. The book by Kate Williams is excellent and now looking at my next purchase of her work. What A MARVELLOUS history of Josephine! If you could sum up Josephine in three words, what would they be? What a complex woman. There is no easy way to sum her up, a real mixture of siren and sycophant, manipulator and manipulatED! I ended up feeling sad for her mostly as she is certainly one of the most misunderstood women of history. I knew, from a previous book, of her imprisonment and I have always firmly believed that this period of her life for ever changed her as a woman and is responsible for many of the slightly dodgy things she did afterwards! She never wanted to feel impotent again - unfortunately, Bonaparte was probably the worst partner for her to have in this regard. What was one of the most memorable moments of Josephine? I just loved the whole book. No specific point. Just very well written, engaging and informative without being pop.history if that makes sense. Which character – as performed by Sandra Duncan – was your favourite? Sandra Duncan was a revelation - what a lovely narrator. Intelligently narrated and nice nuances to her voice. It was a captivating listen, both from a book perspective and also from the narration perspective. Definitely recommend this marvellous book. I didn't find the text very well written, and the narrator could not pronounce any of the French, which is a bit of a drawback! However, I did find the book packed with amazing facts. It may not be the greatest historical work ever, but I did find it very interesting. I did not much enjoy the narration. Style a bit too theatrical to my taste, but especiallly I found the poor French pronunciation irritating and distracting. Josephine has her story delivered to us in a very calm way. I will however go through the book again as I think I have missed pieces. A good book that I would recommend. Entertaining and at a good pace, really enjoyed it. The audio description was good and the book gave in insight into Josephine's difficult but in the end privileged life.